The centerpiece of the campaign is a commercial that some of you may be familiar with. It shows nearly a thousand Dr Pepper fans spilling into the streets as they rip off identical-looking suits and blouses to reveal red t-shirts bearing original expressions “describing what makes them unique and different from the rest of the crowd,” according to Dr Pepper’s site. There’s a beefy construction worker whose shirt proclaims “I’m a Momma’s Boy”; a musician who boasts “I’m a Dreamer”; and a cute brunette whose slogan “I’m a Pepper” nods to the soda brand’s iconic 1970s ad campaign—a clever, if ironic, touch, given that the youthful consumers targeted by the current ads weren’t, as the saying goes, even twinkles in their fathers’ eyes then. At the risk of preempting my editor’s letter in the upcoming November issue, which treads this same territory, I feel compelled to point out that Dr Pepper has embraced a concept of extreme relevance to fine jewelers. The one-of-a-kind phenomenon has gathered so much steam this year that hardly a day passes without me hearing or seeing it used to describe all types of jewels—from rather conventional-looking pieces incorporating unusual, and, by the strictest definition, unique gemstones, to truly extraordinary baubles that only exist in limited editions of one. There’s no doubt that these sumptuous Gandhi-inspired earrings from London-based Ana de Costa are one of a kind. Set with 20 cts. of Gemfields Zambian emeralds with natu­ral cognac diamonds in 18k gold, they retail for $120,000. In other words, the phrase—once used to refer to the most rarefied offerings in a jeweler’s repertoire, often bespoke and unquestionably unique (in every sense of the word)—is now being bandied about with such regularity that it’s worth asking what it means, and why it suddenly matters more than ever. In our September “Future of Retail” issue, senior editor Rob Bates’ interview with Dr. Kit Yarrow, a San Francisco psychology professor and coauthor of Gen BuY: How Tweens, Teens, and Twenty-Somethings Are Revolutionizing Retail, offered some key insights. 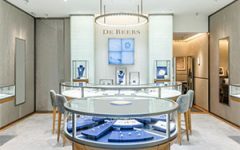 The event, which in the past has covered topics as far-reaching as gold and coral, kicks off on Thursday, Nov. 29, with a cocktail reception and viewing at Van Cleef & Arpels. Two full days of panel discussions, presentations, and book signings at the Graduate Center, CUNY follow.